Culms: Erect or spreading from decumbent bases, simple or sparingly branched, hollow, pubescent near nodes. Blades: Blades flat or folded, 2 to 10 inches long, 1/4 to 1/2 inch wide, surfaces and lower margins with long, soft hairs, midrib prominent. Sheaths: Usually longer than internodes, densely long-hairy. Inflorescences: Panicles, open, spreading, 4 to 12 inches long, nearly as broad, frequently 1/2 length of entire plant, often partially enclosed in uppermost sheaths, usually purplish at maturity; branches numerous, slender, bearing spikelets near ends. Spikelets: Long-stalked, 2-flowered, elliptic, about 1/10 inch long; tips sharp-pointed; glumes unequal; lemmas 1 fertile, 1 sterile; awns absent. Habitat: Waste ground, disturbed areas, cultivated fields, and roadsides, in dry or sandy soils. Forage Value: It provides little forage value and rarely is grazed. However, the fruits are an important food source for quail. 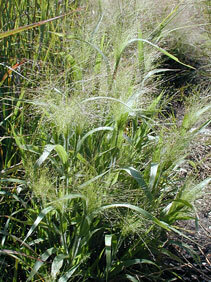 Comments: Witchgrass is a weedy species that invades areas where there is little competition. After maturity, the panicles break off and roll like tumbleweeds.